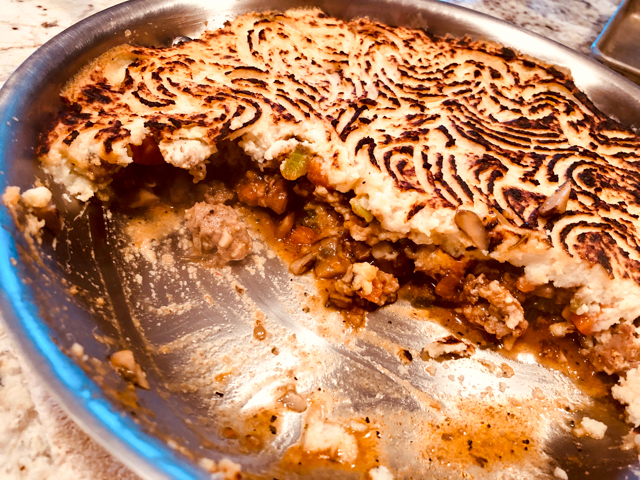 Gastronomic heresy alert: I am calling Shepherd’s Pie a concoction made with ground turkey and cauliflower topping. And what’s even worse, I’ve committed this sin before an I am doing it all over again, without a hint of shame. This preparation is filling but moderately so. It won’t let you go into a state of total lethargy once you move away from the table. It is also low in carbs and saturated fat, in case you worry about those details. 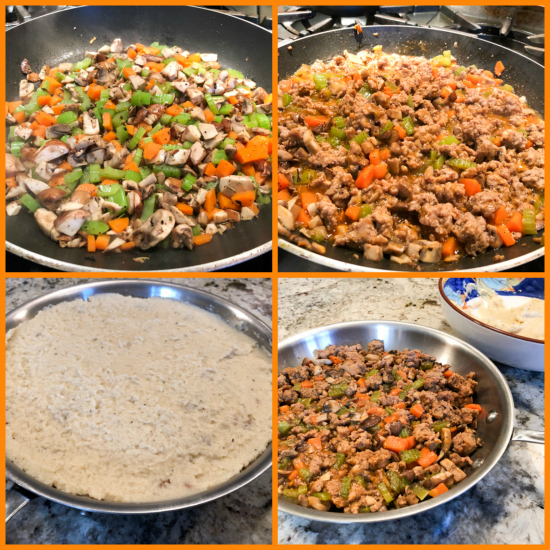 I used a trick quite popular in keto-type recipes to give ground turkey a more pleasant texture upon cooking. It involves baking soda and a few minutes of your time. Absolutely worth it. Read on the comments for full explanation on the baking soda trick. Heat 2 tablespoons oil in a pan until ver hot. Add cauliflower and cook until softened and beginning to brown. Pour 1/2 cup water, season with salt and pepper, cover and cook until the cauliflower is fully tender, about 10 minutes. Transfer to a food processor, and process until smooth. Add the egg and paprika, and process a few more seconds. Reserve. Prepare the ground turkey: in a bowl, add the meat, one tablespoon water, ¼ teaspoon salt, ¼ teaspoon pepper, and baking soda, mixing everything together. Set aside for 15 minutes. Heat remaining 1 tablespoon oil in a 10-inch skillet over medium heat until shimmering. Make sure to use a skillet that can go under the broiler. Add mushrooms and celery and cook until no liquid remains. Stir in harissa and cook for a few more minutes. Add broth, carrots, and Herbes de Provence, and bring to a simmer. Add the turkey meat, breaking it up with a fork. Cover and cook until turkey is cooked through, about 10 minutes, stirring and breaking up the meat every few minutes. Whisk cornstarch and the 2 tablespoons water together in small bowl, then stir mixture into filling and continue to simmer until thickened, about 1 minute. Adjust seasoning, if necessary. Pat the meat mixture to make it leveled, and spread the cauliflower puree all over the surface. 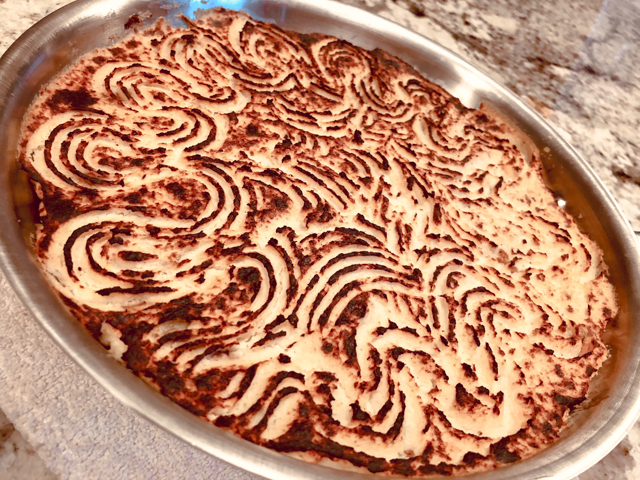 If you like, use tines of fork to make a pattern of ridges on the surface. Place skillet under the broiler and broil for about 10 minutes, if necessary move the pan around to get homogenous color on the surface. Allow to sit for a few minutes before serving. Comments: Quite often ground turkey develops a dry, unpleasant texture when cooked, unless you use alternative methods such as pressure cooking, or the crock pot low and slow for a long time. The addition of baking soda changes everything, by raising the pH. This has two benefits: it reduces the interaction between protein molecules in the meat (by a mild denaturing effect) and accelerates browning. Since the proteins are not able to interact with each other very efficiently, they acquire a more tender texture. It is important to not overdo it. You don’t want the meat to get all mushy, it is a delicate balance. In other words, don’t add the baking soda and walk away for a couple of hours. This recipe can be assembled all the way and kept in the fridge. When it’s time to eat, place it covered in a low oven to warm up, then uncover and run under the broiler. Leftovers are superb, and as usual, they showed up as my lunch two more times that week. Before you leave, grab a pin!